In preparation for this past Friday night, we bought our tickets in advance, worked the google like the pros we are, and planned an epic Hunger Games Dinner Party! LLC was the host/master of ceremonies/gamekeeper (haha) and put on quite the pre-Hunger Games show. We started the evening with a Prim-inspired appetizer: Bread with Goat Cheese, Strawberries, and Basil. Then LLC served Katniss’ favorite dish from the Capitol – Lamb and Plum Stew – as well as a delicious Carrot Soup (recipes below). Of course I brought dessert – a Red Wine Chocolate Cake with Fresh Whipped Cream (I'll post the recipe tomorrow). According to the Unofficial Hunger Games Cookbook (PDF): "The feast served during Katniss's first night away from her family ends with a decadent chocolate cake. Amidst the depression of facing almost-certain death (not to mention Haymitch's dispiriting drunkenness! ), this sweet ending perhaps makes Katniss realize that things aren't as bad as they may seem." The movie was awesome. If you haven’t already, you should definitely read the book and then go see the movie. 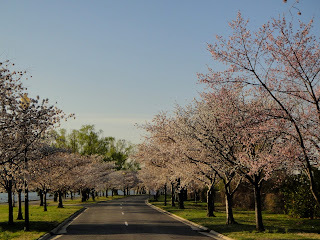 Saturday morning I went for my last pre-Cherry Blossom 10 Miler long run. Not surprisingly, the blossoms are early this year and were already out in full force! The Tidal Basin was kinda crowded with cherry blossom viewers (i.e. tourists), but I didn’t mind too much. Instead of running on the crowded paved path I opted for the fairytale-esque petal “paved” grass path on the side. 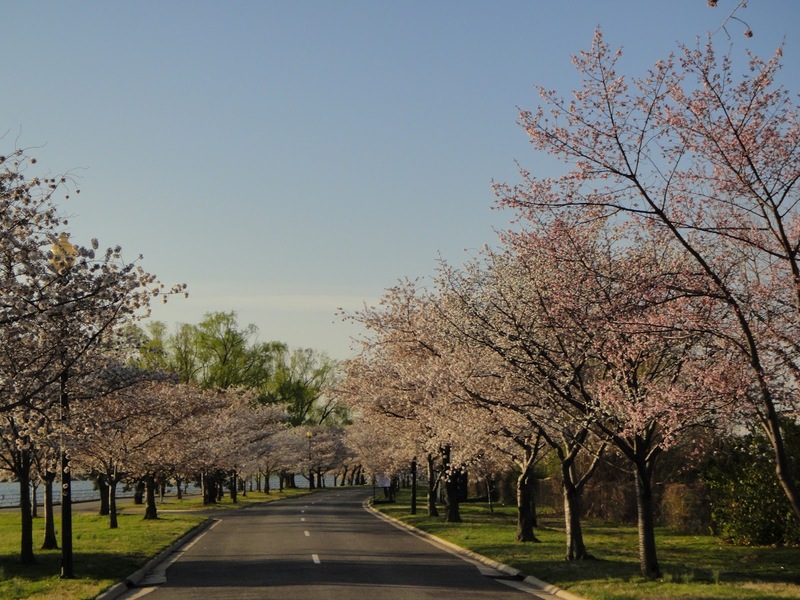 If you’re looking for a less crowded Cherry Blossom experience, I suggest you go a bit further than the Tidal Basin and run/walk/bike around Haines Point. Anywho, now for the Hunger Games recipes. I know the Lamb and Plum stew sounds weird, but it was SUPER delicious and I strongly suggest you try it out! Place lamb, salt, pepper, and flour in a large mixing bowl. Toss to coat meat evenly. Heat olive oil in a large pan and brown the meat, working in batches if you have to. Remove lamb to a side plate. Pour off fat, leaving ¼ cup in the pan. Add the garlic and onion and sauté until the onion becomes golden. Deglaze frying pan with the ½ cup water, taking care to scrape the bottom of the pan to stir up all of the tasty bits of meat and onion. Cook to reduce liquid slightly, then remove from heat. Place the lamb and garlic-onion mixture in a large stockpot. Add beef stock and sugar, stirring until sugars are dissolved. Bring mixture to a boil, cover, and simmer for 1½ hours. Add the vegetables, dried plums, herbs, and ginger ale to the pot. Simmer for 30–45 minutes, or until meat and vegetables pierce easily with a fork. Saute the onion, garlic and nuts in the butter and olive oil until the onions are clear. You can sprinkle in a little salt to help draw the moisture out of the onions. Towards the end of cooking, stir in the seasonings. Stir nut mixture into carrot mixture. Puree about half of it in a blender until smooth. (If you want a completely pureed soup, the original recipe says to puree it all in the blender. We prefer some chunks, so we only did half). Whisk in the milk. As I mentioned in the beginning, I often leave this step out until I'm just about to eat a bowl of soup. I'll stir in a little milk, a spoonful of yogurt or some cottage cheese just before serving (and just after reheating, if I'm using the microwave).